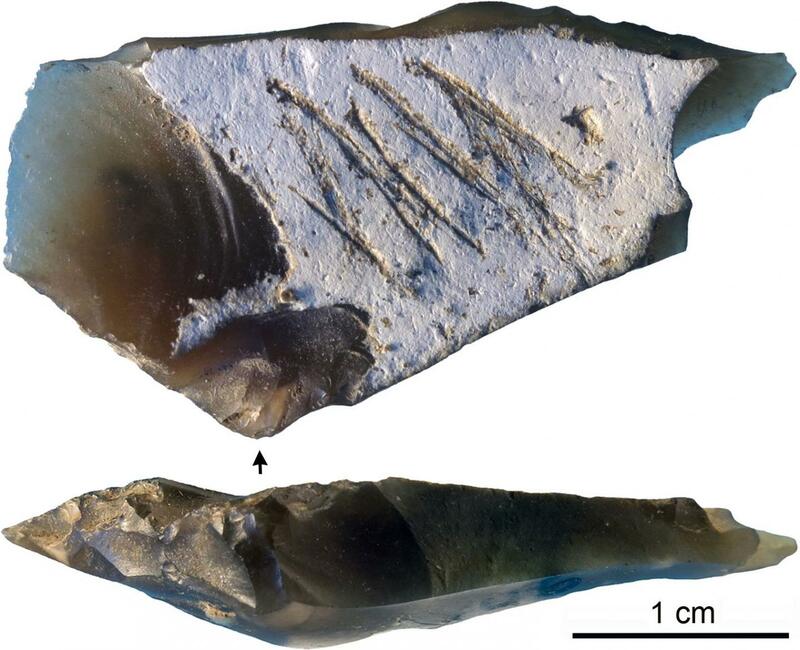 A flint flake from the Middle Paleolithic of Crimea was likely engraved symbolically by a skilled Neanderthal hand, according to a study published May 2, 2018 in the open-access journal PLOS ONE by Ana Majkic from the University of Bordeaux, France and colleagues. The authors developed a detailed framework for interpreting engravings on stone artifacts. Engraved stone artifacts are important clues to the history of human culture and cognition. Incisions on the cortex (soft outer layer) of flint or chert flakes are known from Middle and Lower Paleolithic sites across Europe and the Middle East. However, it can be difficult to determine the action that created an incision: was it an accidental scrape or purposeful engraving? To address this issue, Majkic and colleagues created an interpretive framework that allows researchers to classify the structure and patterns of engraved cortexes and cross-check these attributes with a list of possible causal actions. They tested this methodology with an engraved flake from the cave site of Kiik-Koba in Crimea. The many stone artifacts at the site are associated with Neanderthal remains and date to around 35,000 years ago. Following microscopic examination of the grooved lines on the flint cortex, the researchers concluded that the incisions represent deliberate engravings that would have required fine motor skills and attention to detail. These engravings appear to have been made with symbolic or communicative intent. If this interpretation is correct, this engraved flake would join a growing list of signs that Neanderthals engaged in symbolic activities, along with evidence of intentional burial, personal ornaments, and other decorated objects. This has implications for the question of when and how many times this sort of cultural expression has evolved among hominin populations. The researchers hope to hone their framework further for use with artifacts of varying ages and cultural contexts. Funding: This research was financed through the PICS collaborative research project "The emergence of symbolically mediated behavior in Eastern Europe" granted to the authors by the CNRS and NASU (PICS-NASU 3-15; 3-16). One of the authors (AM) acknowledges financial support of the Wenner-Gren Foundation for Anthropological Research in the period 2013-2017 that enabled completion of the doctoral studies, including this research that was a part of it. One of the authors (FdE) acknowledges support of the Research Council of Norway through its Centre's of Excellence funding scheme, SFF Centre for Early Sapiens Behaviour (SapienCE), project number 262618. The funders had no role in study design, data collection and analysis, decision to publish, or preparation of the manuscript.